Game of Thrones is full of medieval settings, and for that reason alone means it’s always on the lookout for locations that have the same look and ambience. Therefore, it seemed only natural that Spain would be chosen among some of the most prominent lands to feature in the show. After countless hours of ocular visits, the show’s scouts saw just exactly what they needed. Now thousands upon thousands of people flock to the country to witness some of the most iconic films sets from the GoT series. Dating back to the Roman era, the bridge of Cordoba seems to be the very definition of an ancient structure. Although it has undergone numerous restorations over the centuries, little has changed in terms of its oldly-worldly look. According to Watchers on the Wall, it was closed for a quick shoot, but the scene it depicted on the show was crucial. The bridge served as Volantis, which was where the slaves were freed by Varys and Tyrion. Designated as a UNESCO World Heritage Site, the Alcazar of Seville is the physical culmination of the union of various cultures including Muslim and Christian. Its correct name is actually Los Reales Alcazares or Royal Palace Fortresses due to the fact that the complex is made of three main interconnecting parts. These sections were built by different monarchs who ruled the area over the years; hence the combination of several cultures. The most striking features of the palace are intricately designed and coloured tiles, the gardens and pools, and the domed ceiling of the Ambassadors’ Hall which is adorned with shiny stones. All of these were showcased in the show as the site became Dorne, the stronghold of the Martells; a fitting match to the very nature and image portrayed by the family (at least initially) – romantic, sweet and gentle. Girona Cathedral is another iconic structure, built between the 11th and 13th centuries. Constructed in Romanesque and Gothic style, the cathedral houses the widest Gothic nave in the world. At 72 feet wide, its nave is the second widest in the world next to St. Peter’s Basilica, if the style of architecture is not considered. The cathedral stood in as the infamous Sept of Baelor in the series which was (spoiler alert) blown up at the end of Season 6. It’s kind of sad that this majestic structure will not be shown in the series anymore. 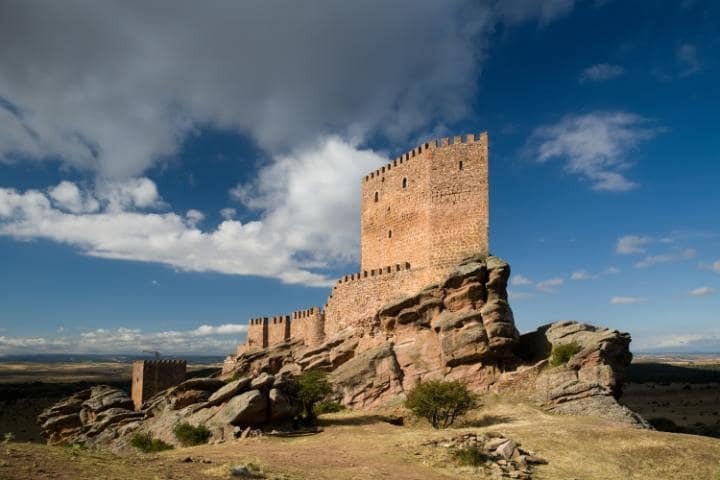 Out in the middle of nowhere within the Spanish province of Guadalajara lies the Castle of Zafra, a fortress constructed in the 12th century which now stands atop a sandstone cliff. The Telegraph mentioned that it had a strategic importance as a defensive structure and effectively withstood countless sieges. This location was used in one of the most pivotal moments in the show, when the truth about Jon Snow’s parents was finally revealed. The production team did a wonderful job shooting one of the most breathtaking moments in an equally breathtaking location. The Game of Thrones fever has truly taken over the world. In the span of a few years corresponding to its six seasons, the show’s fan base grew so much that there are people that travel just to track down and visit the show’s filming locations. In a similar level of adoration, fans all over the world mimic GoT characters through costume parties and similar gatherings in much the same way as other classic shows and films. GoT outfits were all the rage last Halloween, and have become a focal point at most fancy dress parties. On the digital side, apart from fan-made videos and parodies, Business Insider sampled what it described as the best Game of Thrones app ever, which reproduces the audio in one of the most memorable events in the show – the walk of shame. In case you don’t remember, it’s the scene where the nun rings a bell and shouts “Shame!”. Other digital iterations include video games, with gaming platform Slingo adding to its array of themed and tie up slot games with the Game of Thrones 15 Lines title which features the sigils of different families in the show such as the Starks, Lannisters and Targaryens. Seeing all the different creative outlets tied to the series, it’s safe to say that the GoT phenomenon will not wither anytime soon, especially as fans anticipate Season 7. For your next visit to Spain, be sure to check out these iconic structures. Because if you’re a diehard GoT fan then visiting the real life Westeros will be an experience you’ll never forget.